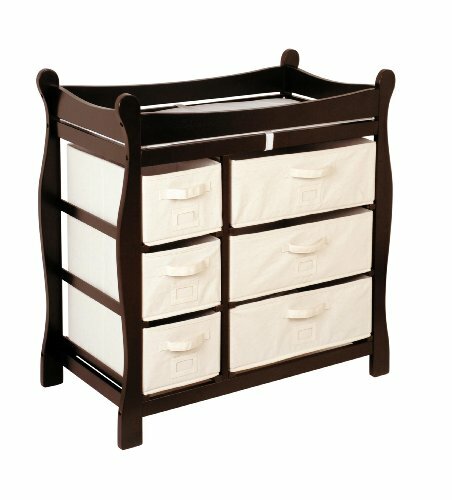 02414 Features: -Sleigh style changing table with six baskets. -Material: wood, hardboard, polyester / cotton fabric. -Espresso finish. -Lots of storage. -Easy pull-out drawers / baskets. -Baskets/drawers are ecru. -Pad and safety belt included. -Card holders for identifying what is in each drawer. -Large / small baskets can be on the left or right. -Safety rails surround the changing area. -Metal support bar for additional stability. -Wood table has a non-toxic finish and hardboard top shelf. -Wipe clean with a damp cloth as needed.